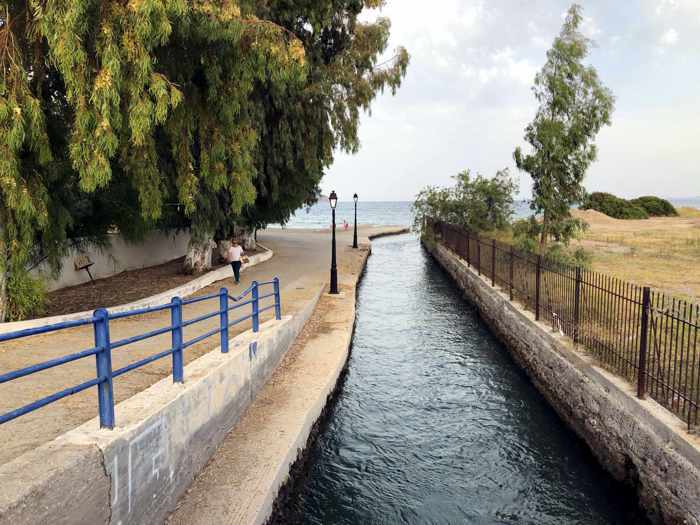 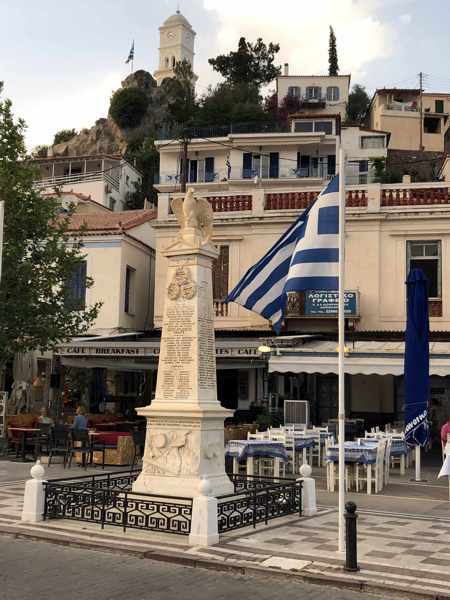 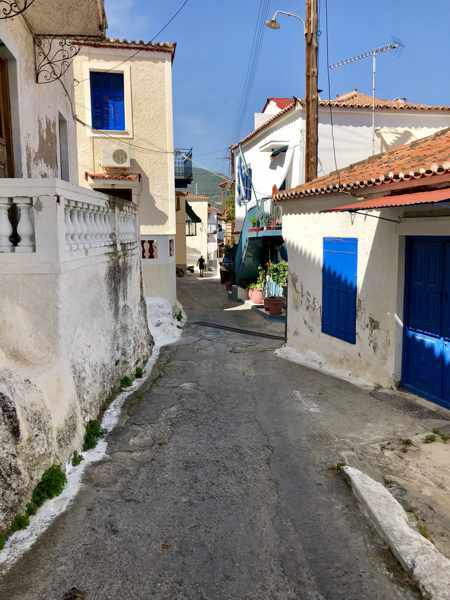 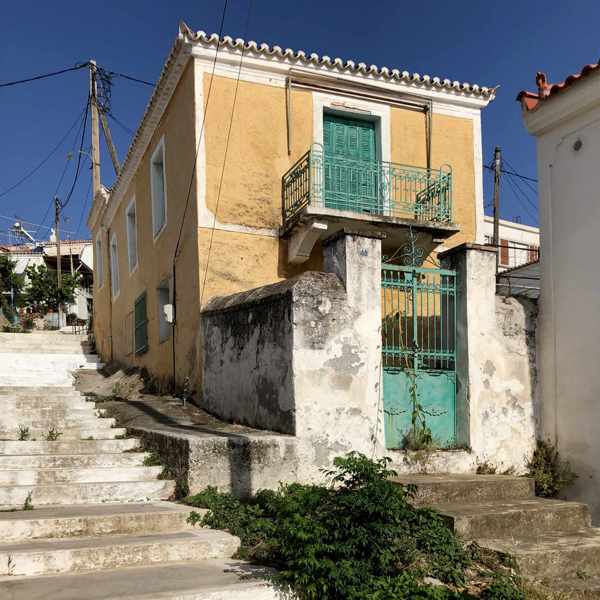 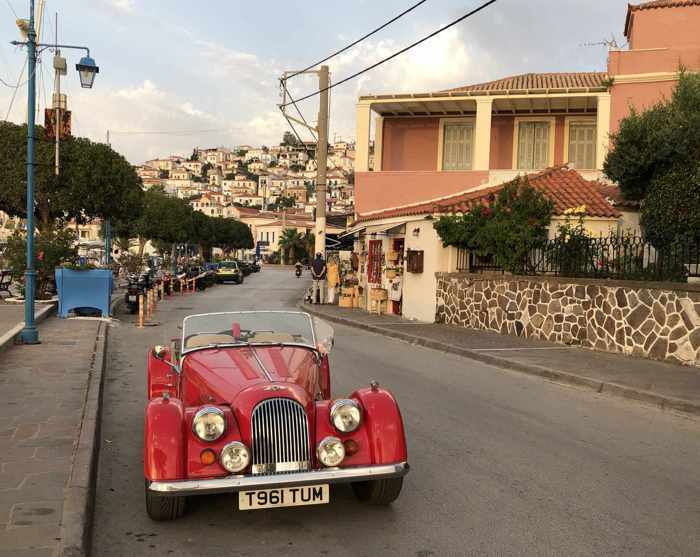 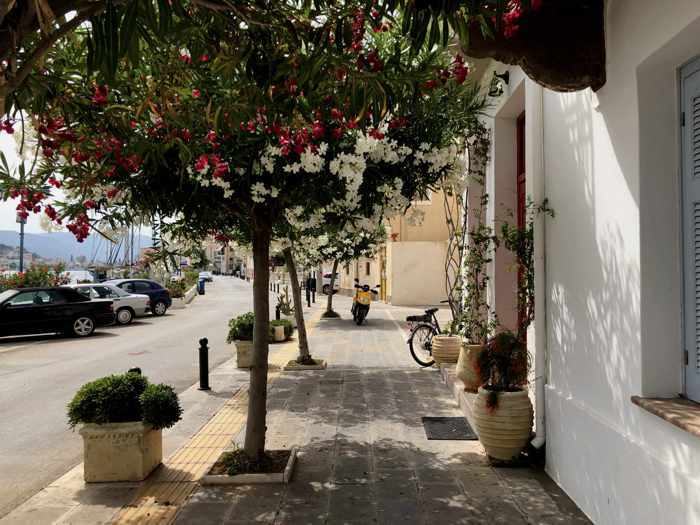 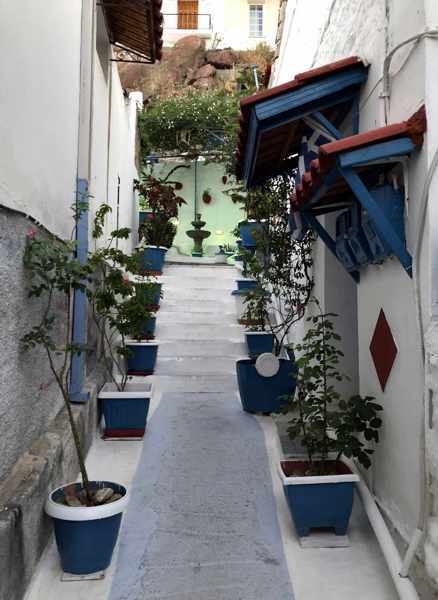 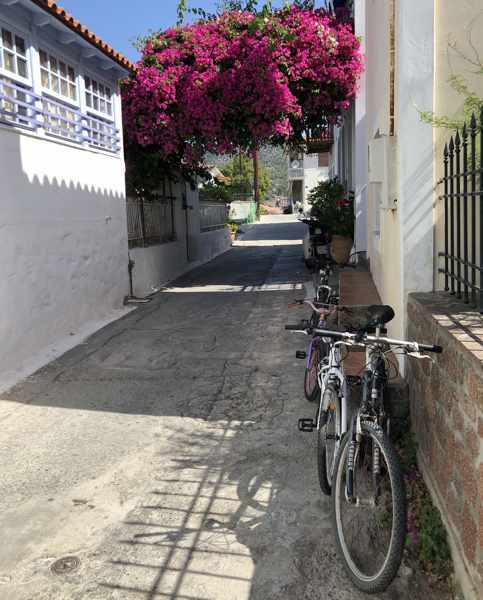 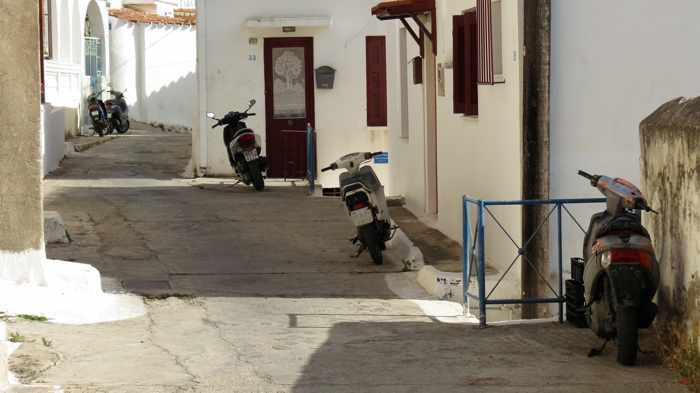 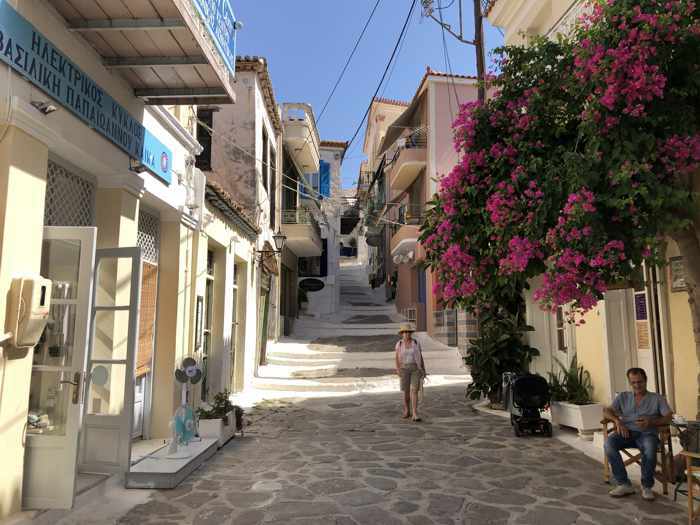 Below is a collection of photos we shot while exploring Poros Town, beaches and seafront areas, and other parts of the pretty island. 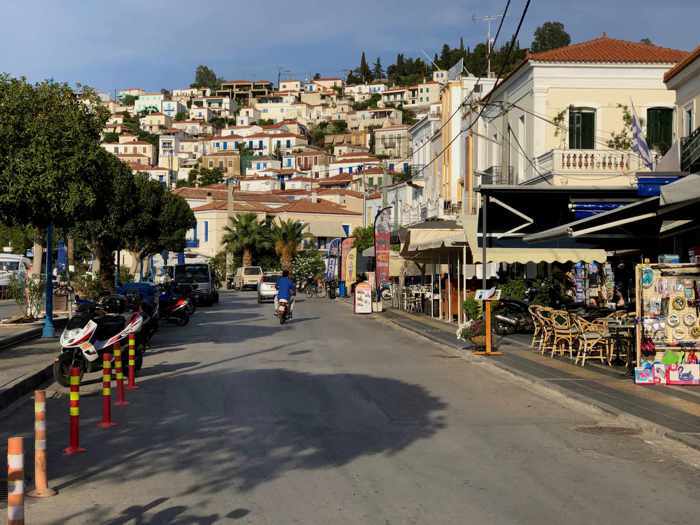 View to the northwest from a vantage point in Poros Town. 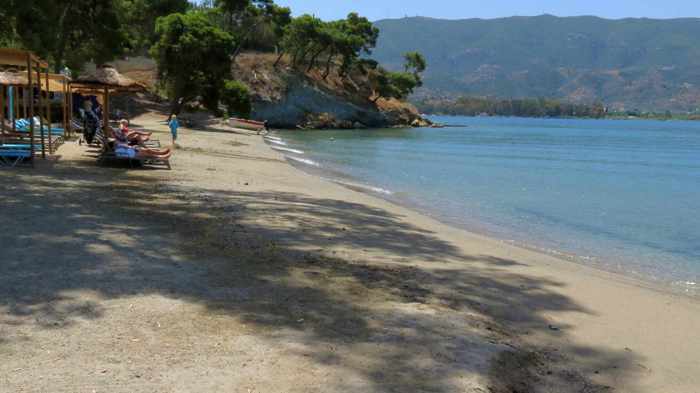 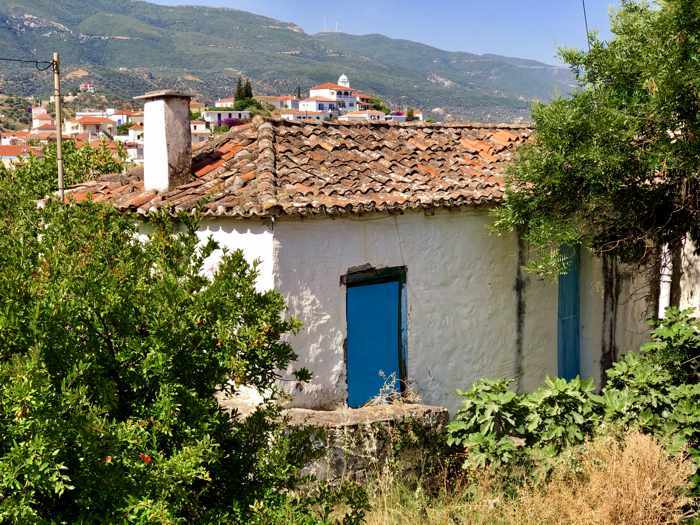 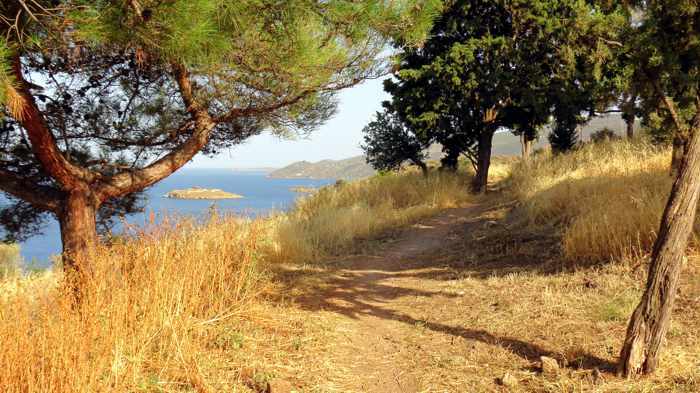 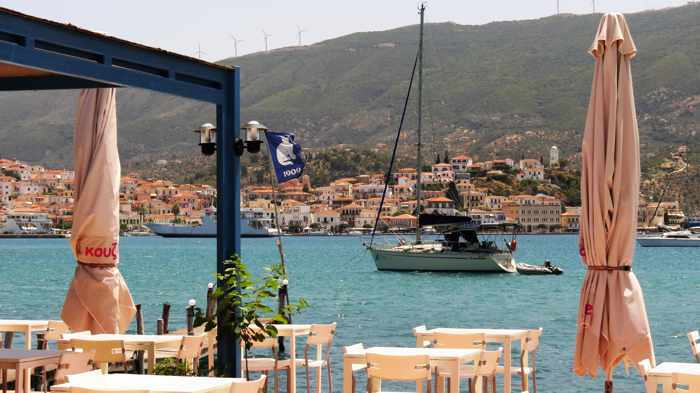 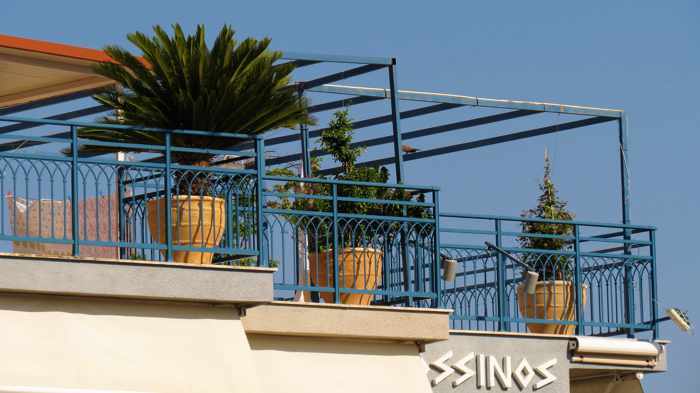 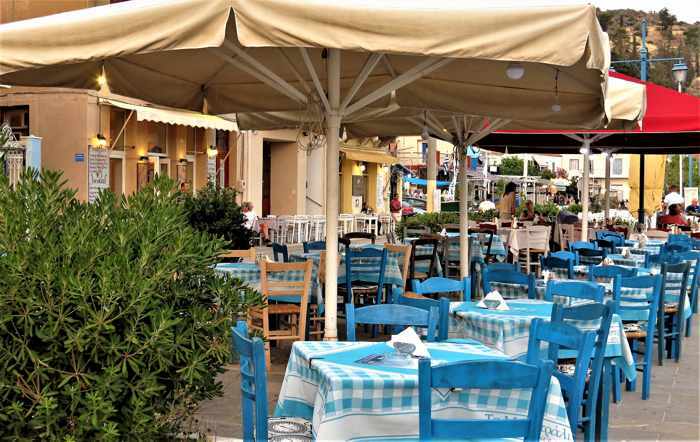 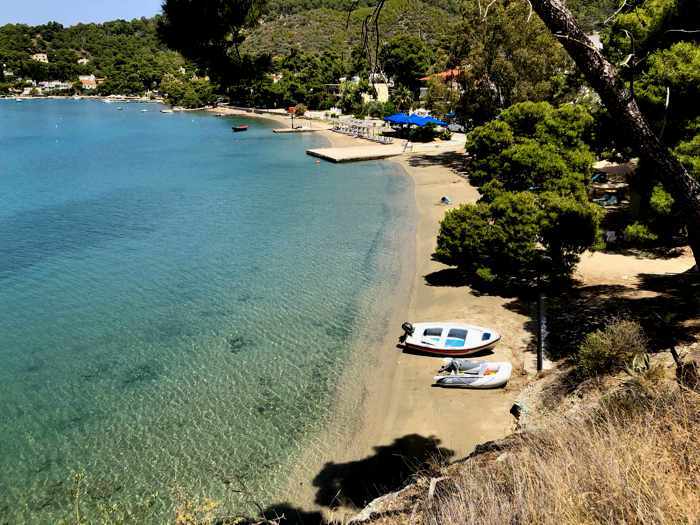 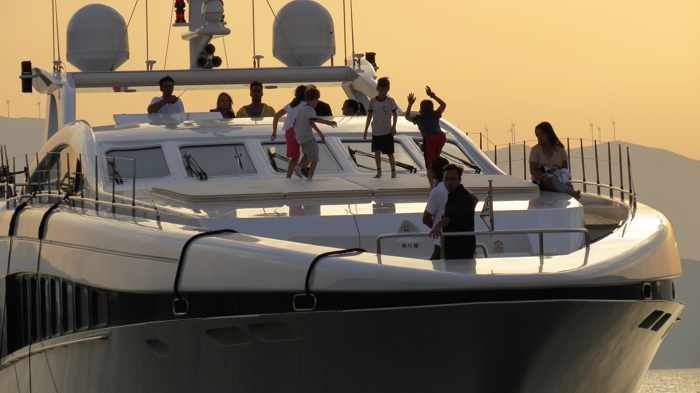 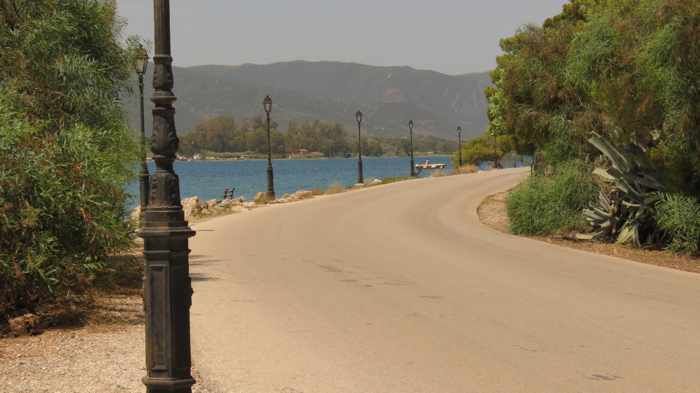 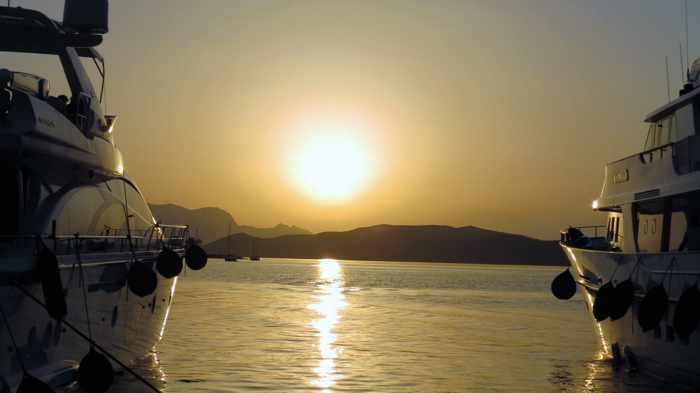 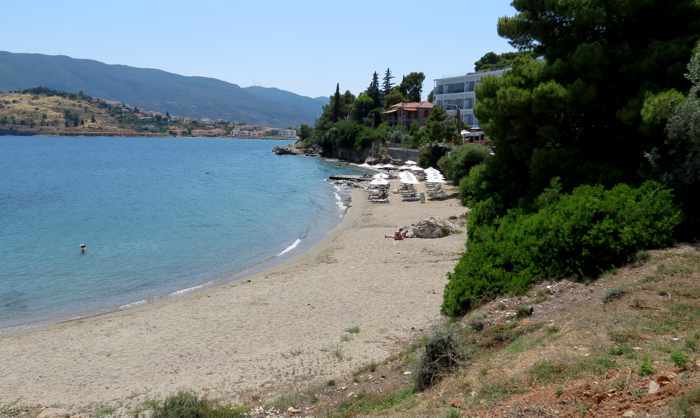 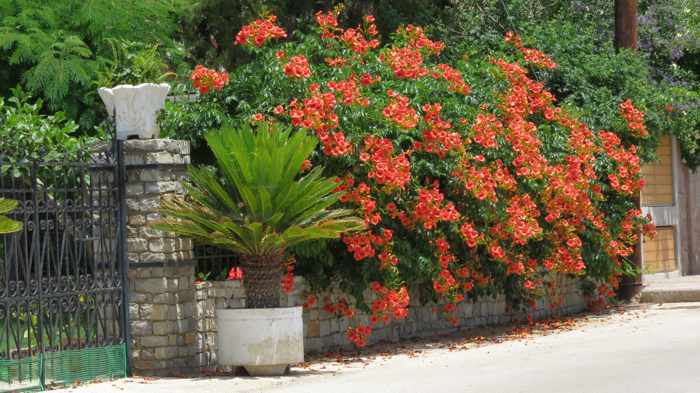 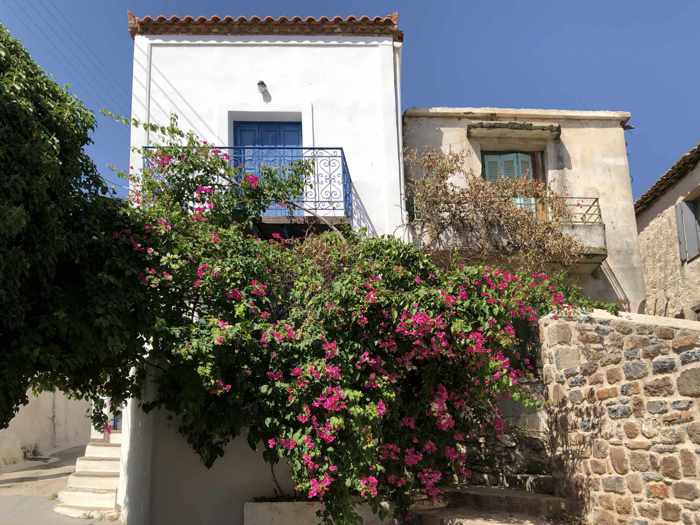 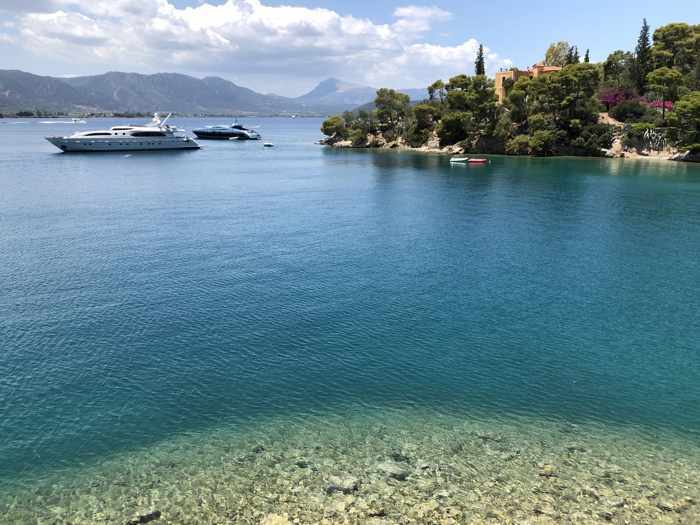 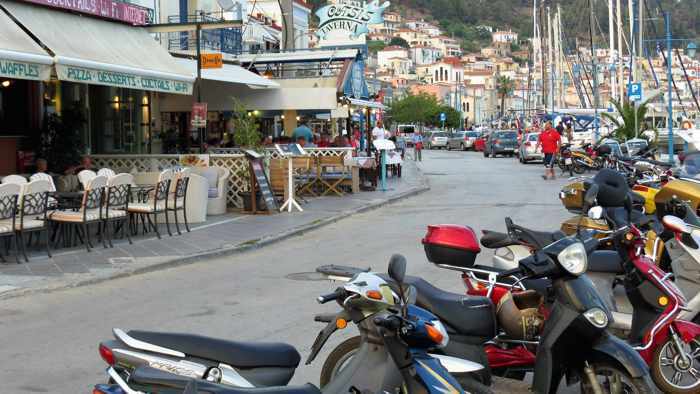 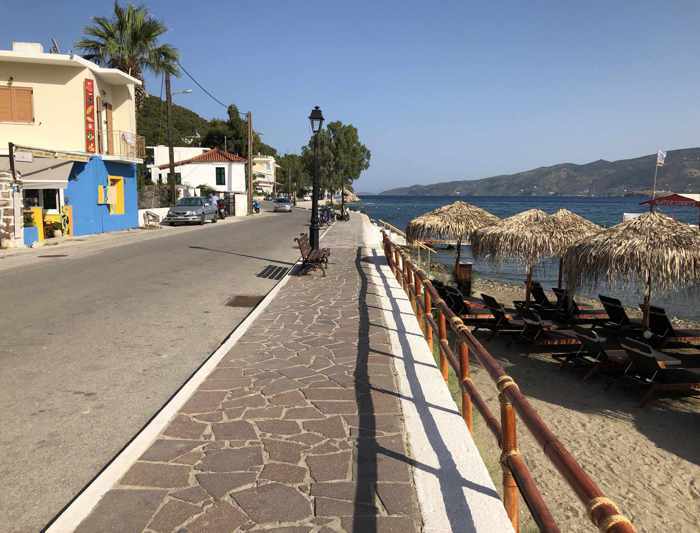 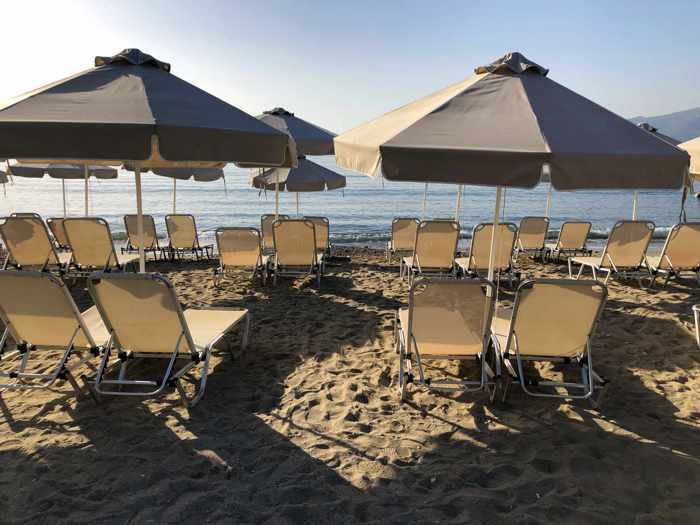 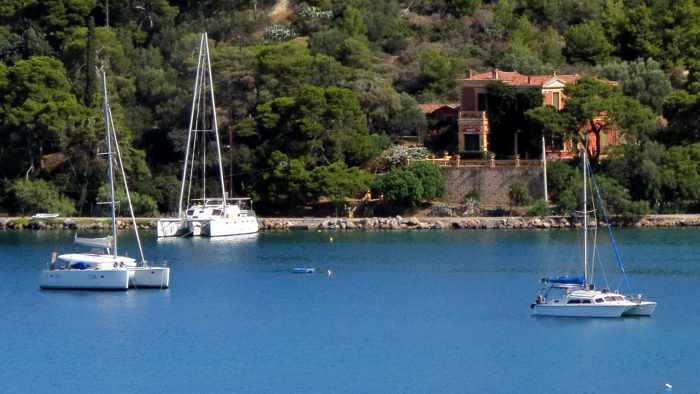 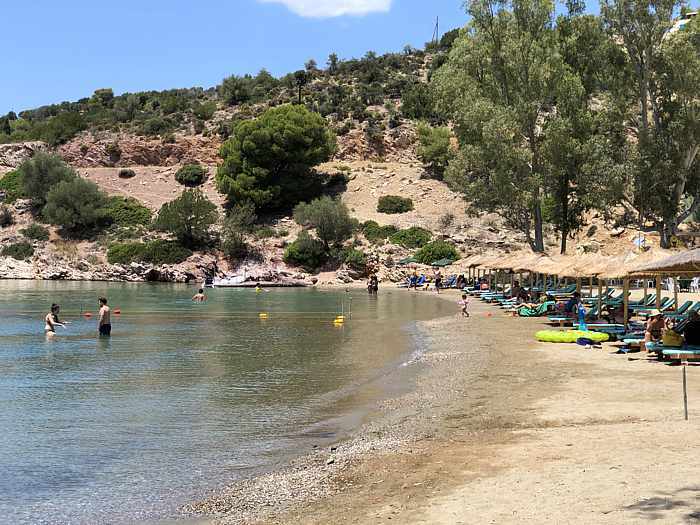 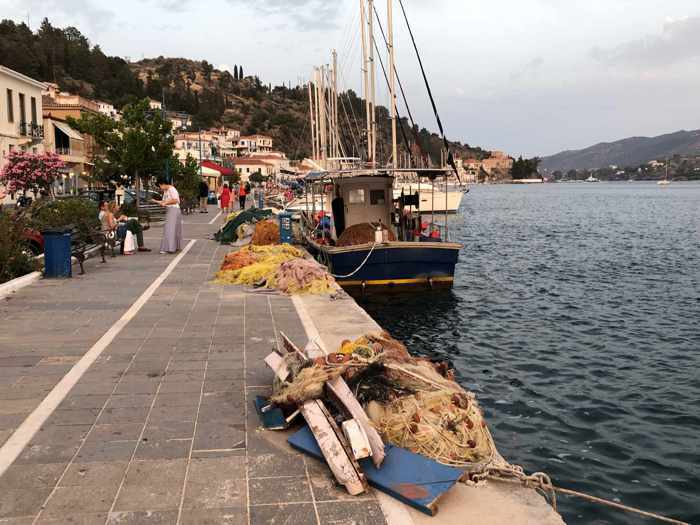 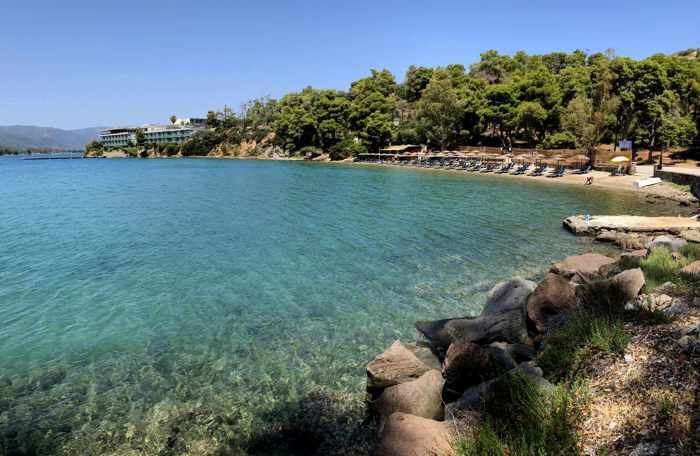 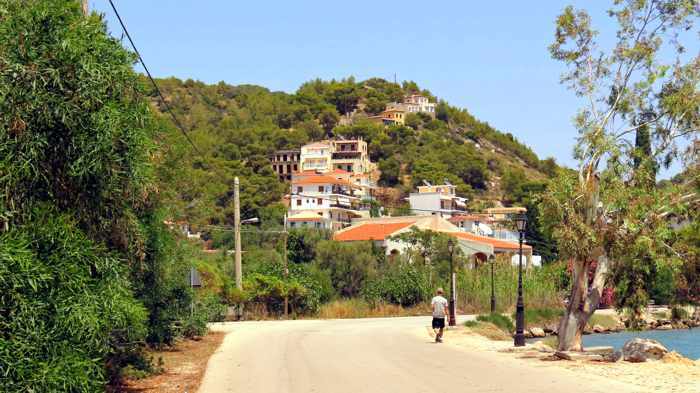 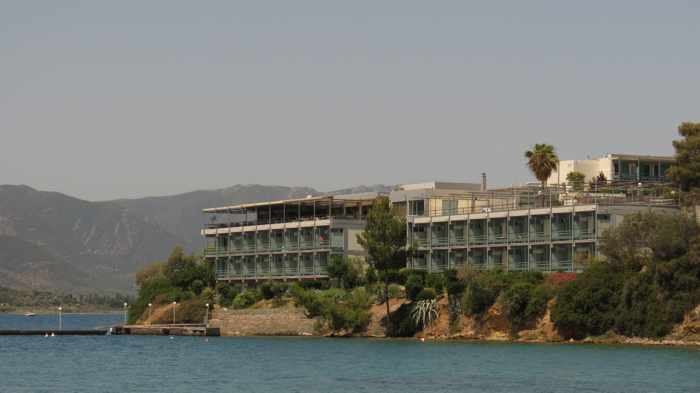 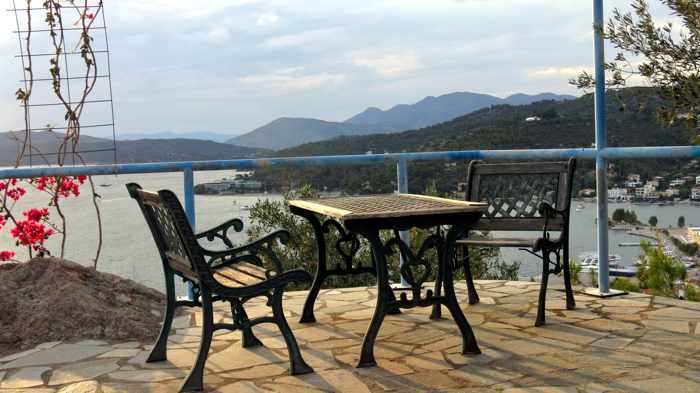 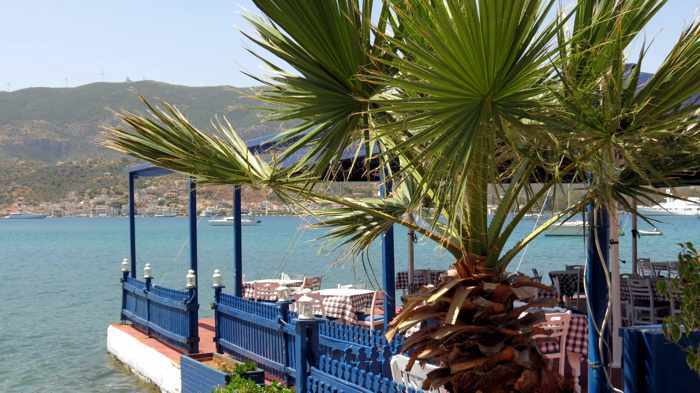 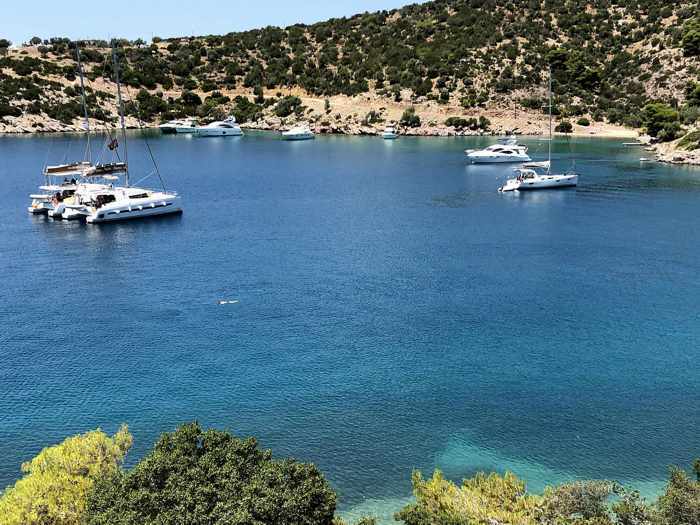 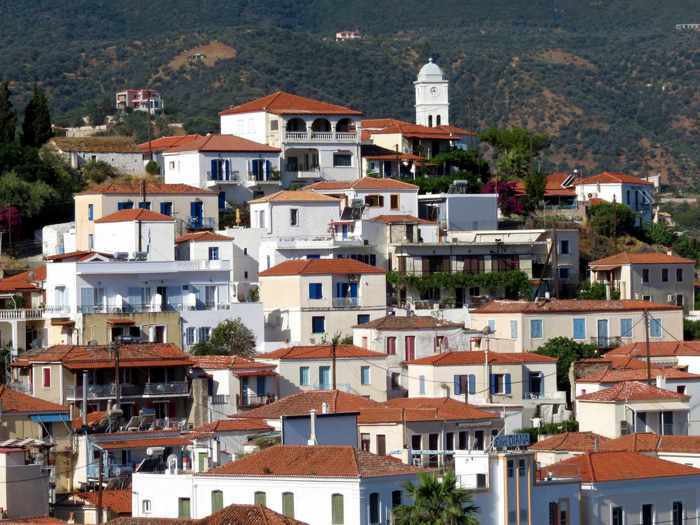 The scenery includes Megalo Neorio Bay, pine-forested hills in the Kalavria area of Poros island, and mountains along the eastern coast of the Peloponnese. 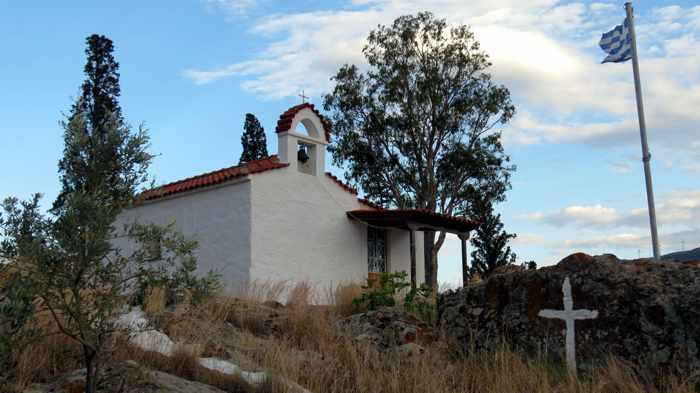 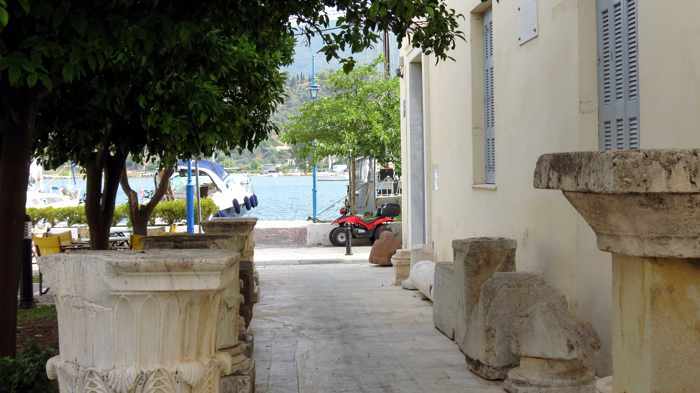 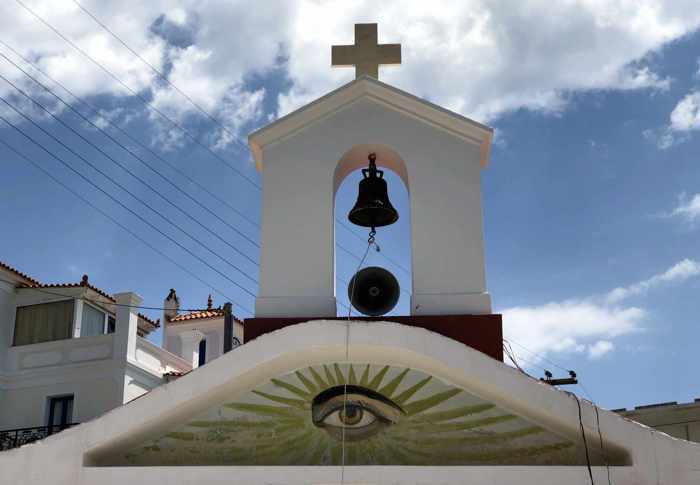 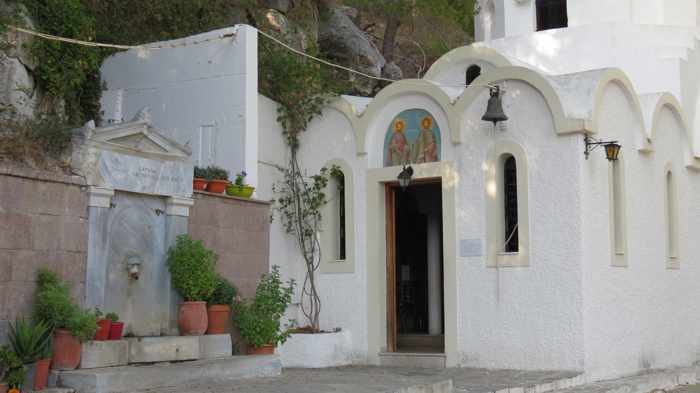 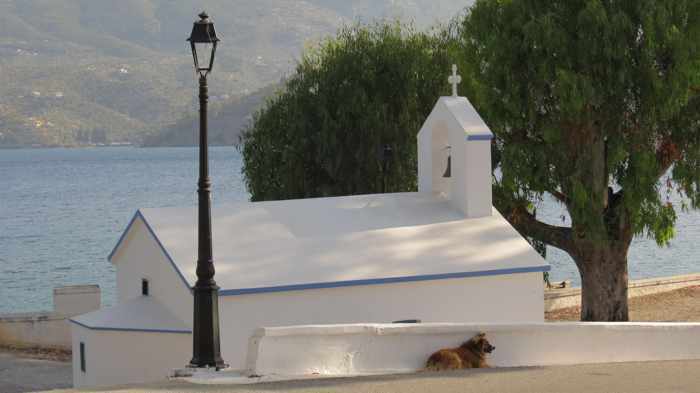 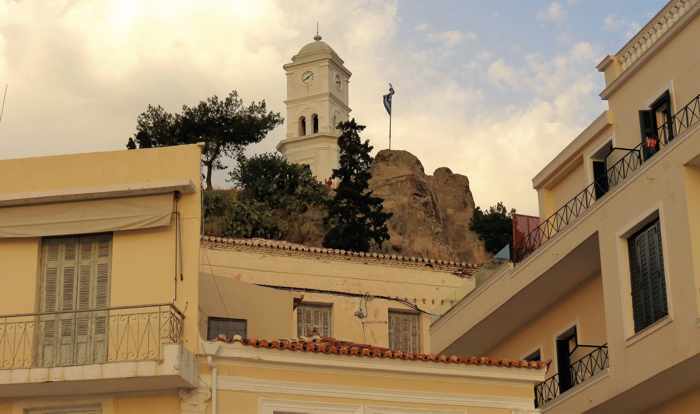 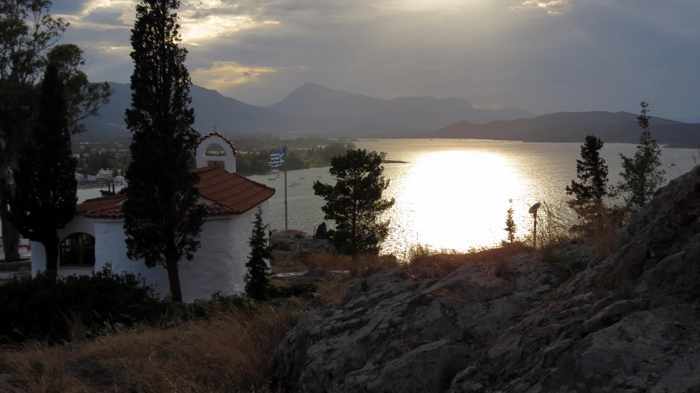 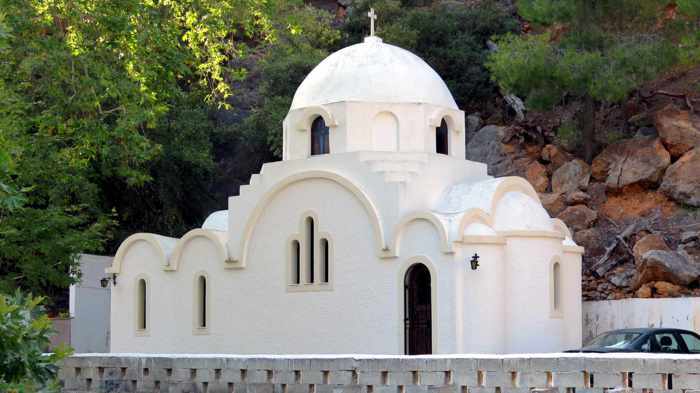 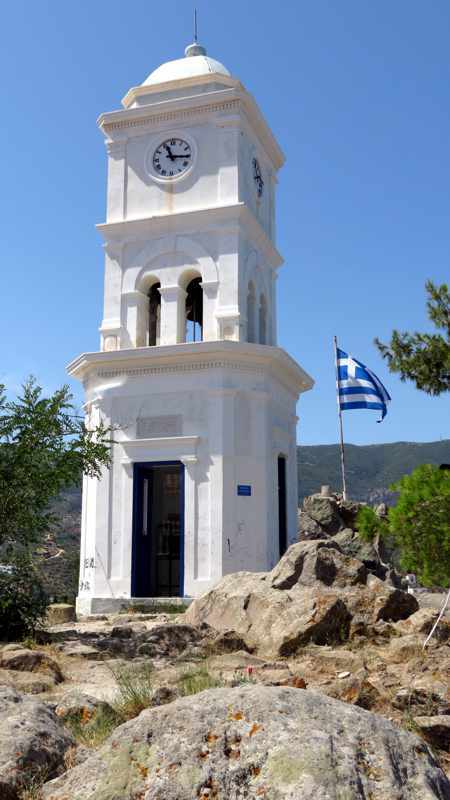 The Holy Monastery of Zoodochos Pigi is one of the main historical sights on Poros. 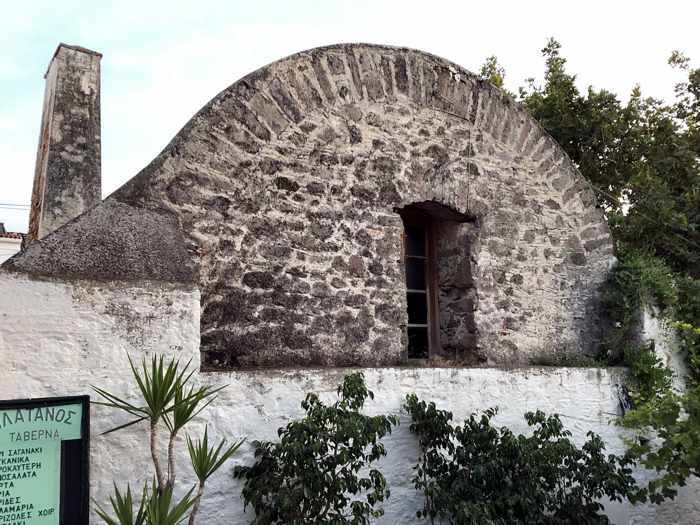 It dates from the 1720s. 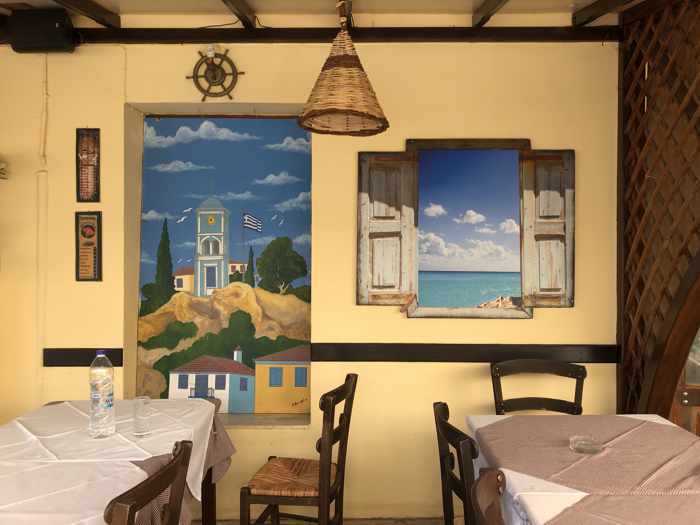 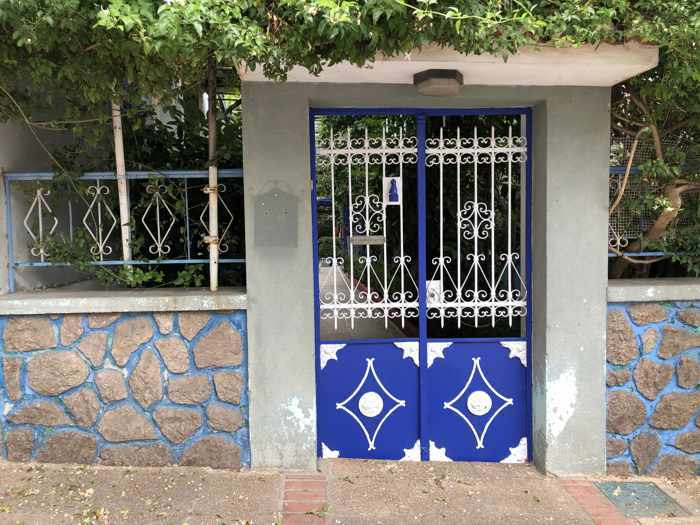 Right next door to the old cistern shown in the previous photo is Platanos Taverna. 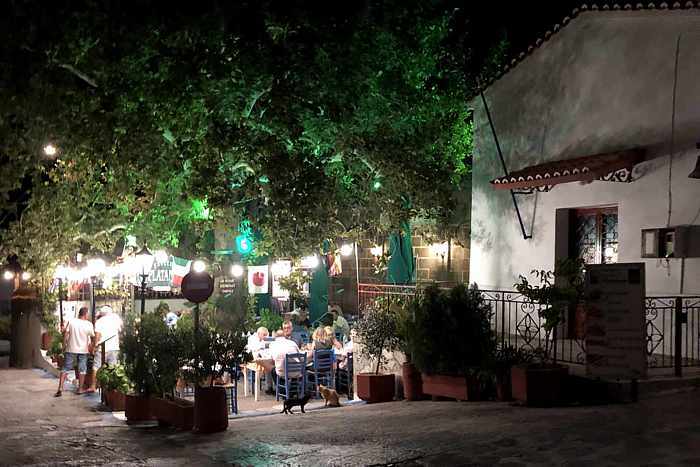 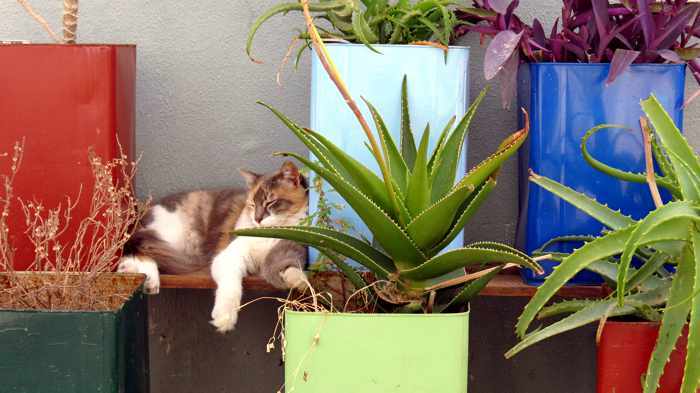 It is named after the giant platanos (plane) tree that shelters its open-air patio. 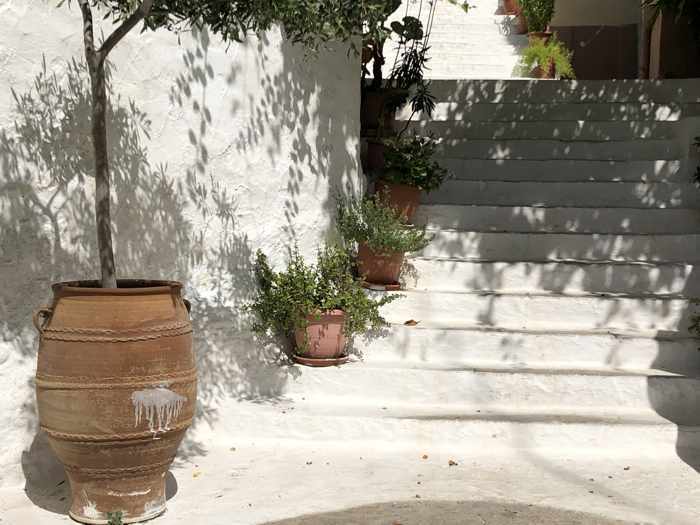 Like the cistern, the tree is over 200 years old. 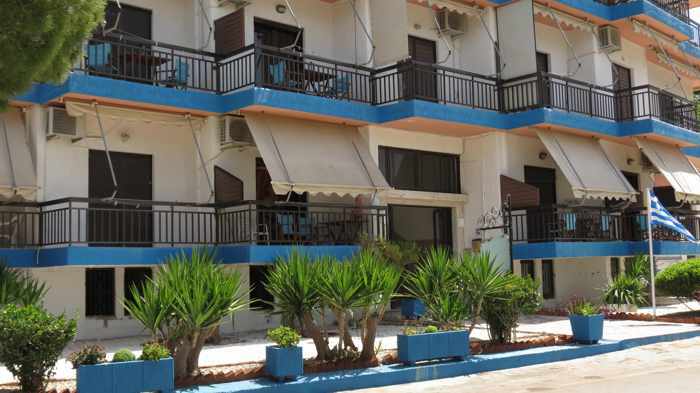 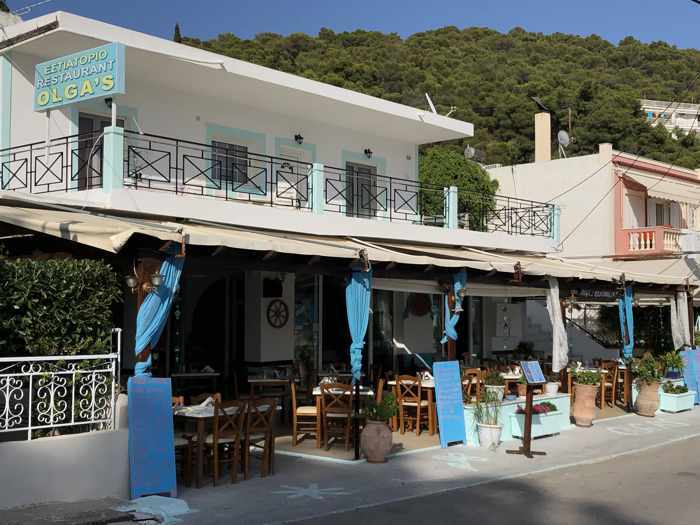 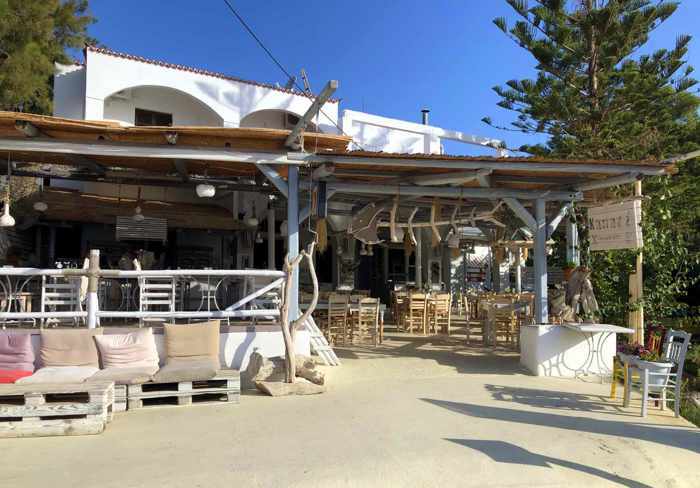 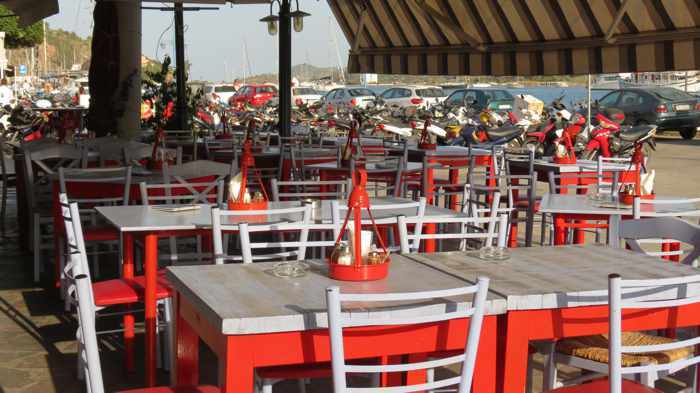 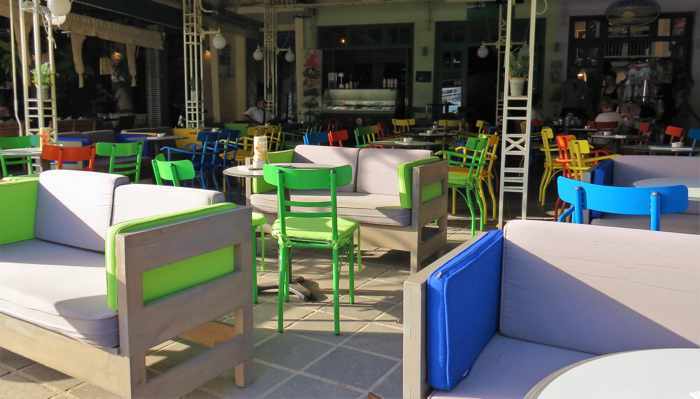 Front view of Kanali beach bar and restaurant on Kanali beach. 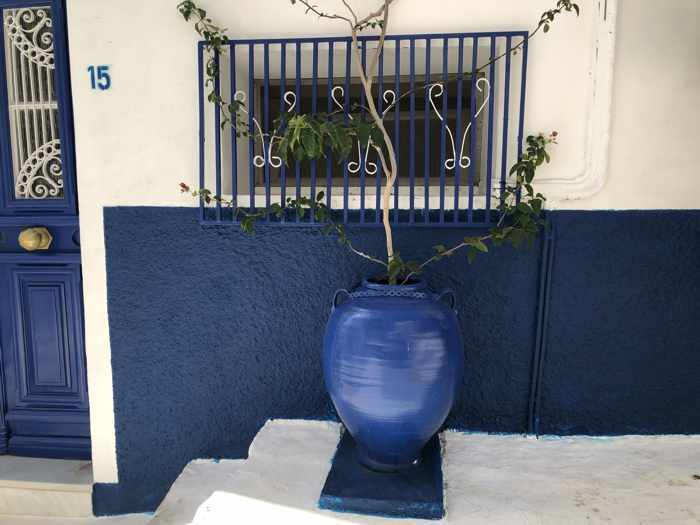 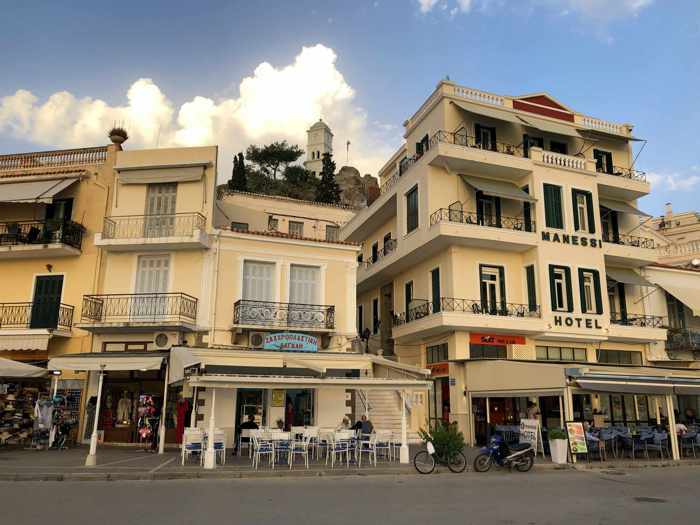 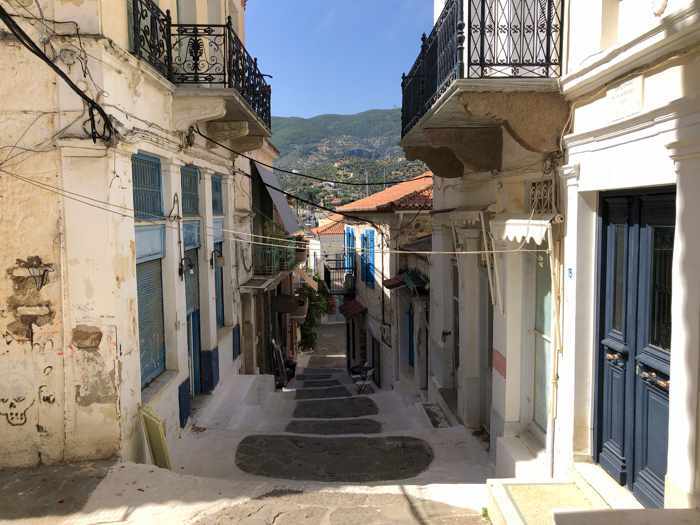 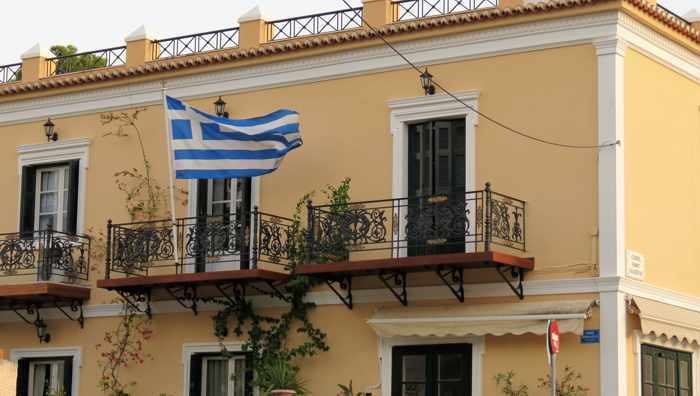 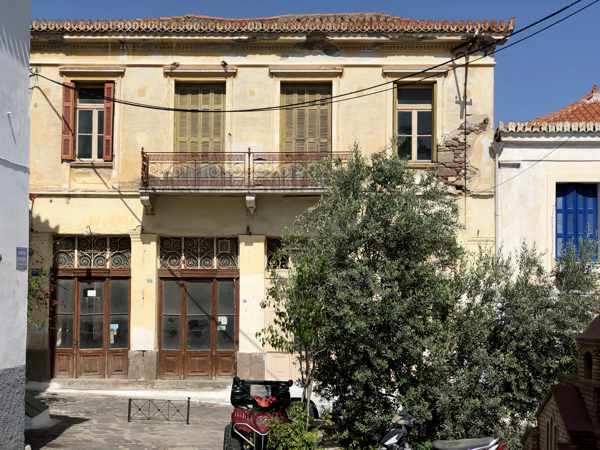 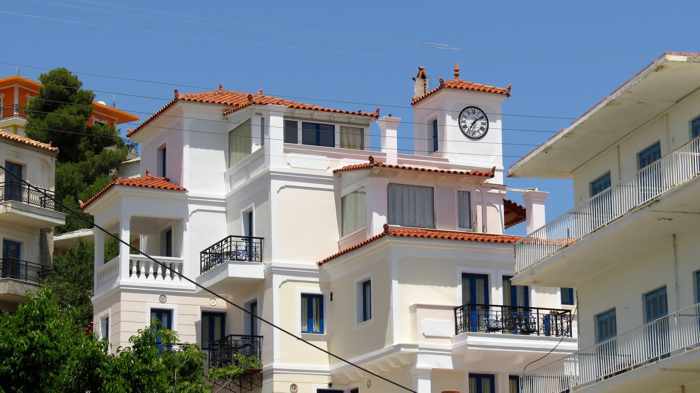 After staying 3 nights in Poros Town, we moved to the Kanali Apartments (situated on the second floor of the building) for our next 4 nights on the island. 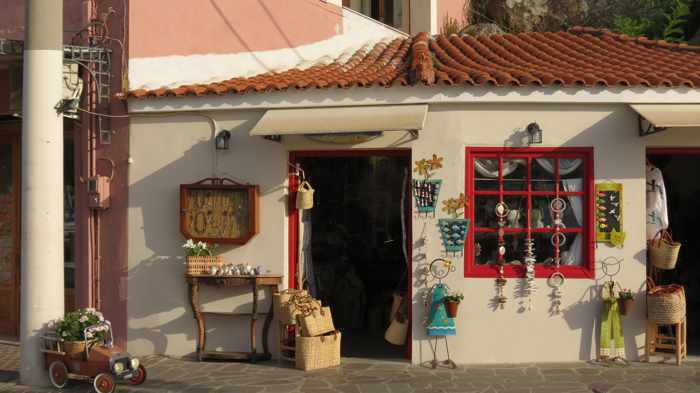 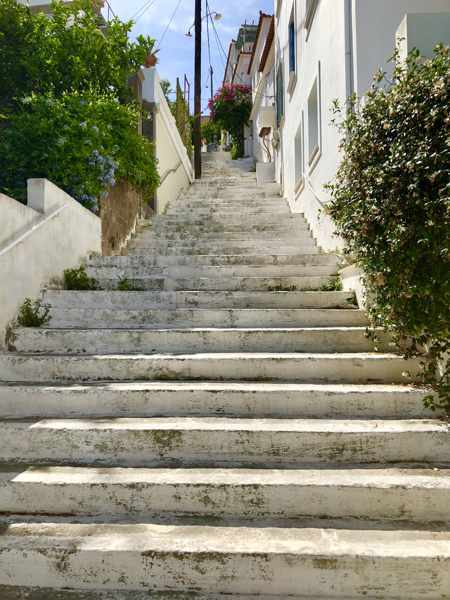 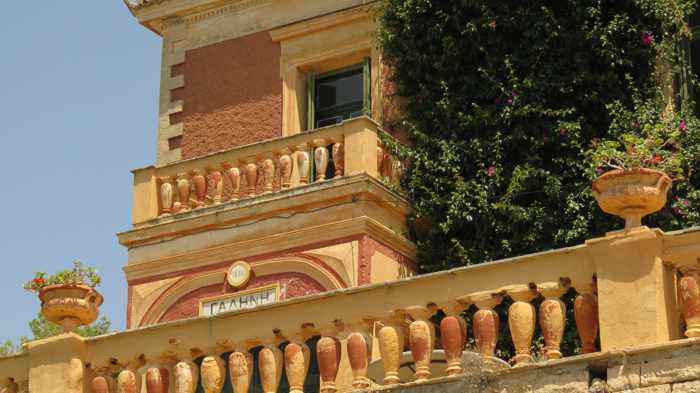 Greta Garbo, Mark Chagall and Henry Miller are some of the famous artists and writers who were guests at Villa Galini during its golden years. 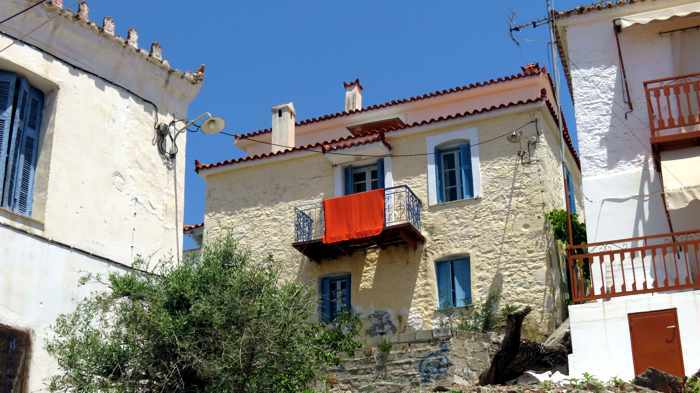 Nowadays the mansion is a private home, and isn’t open for tourists to visit. 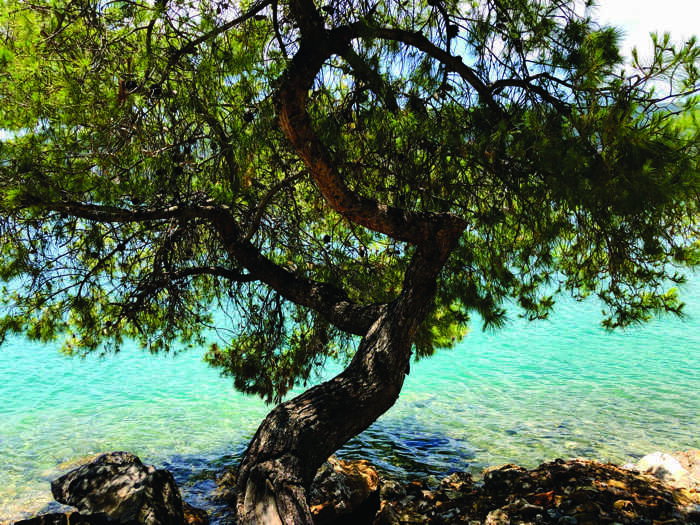 A pine tree on the seaside near Mikro Neorio beach. 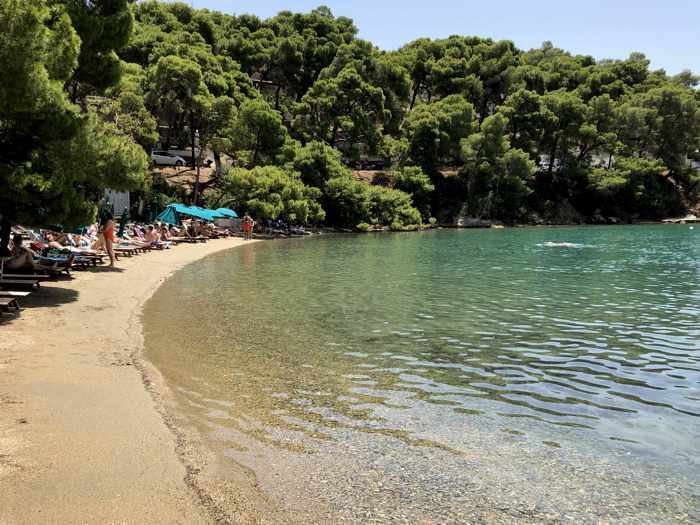 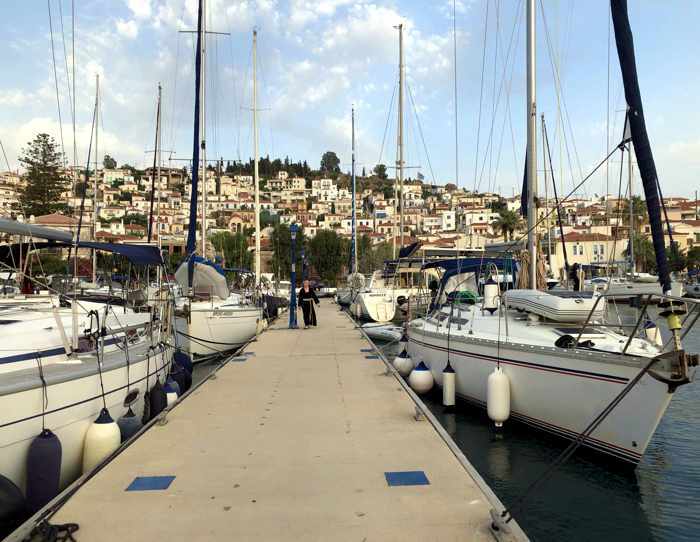 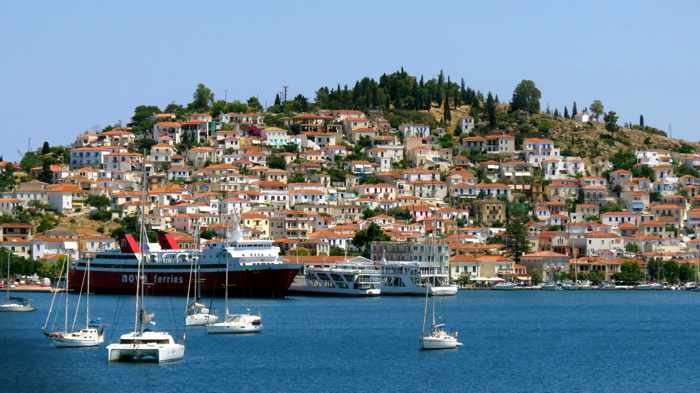 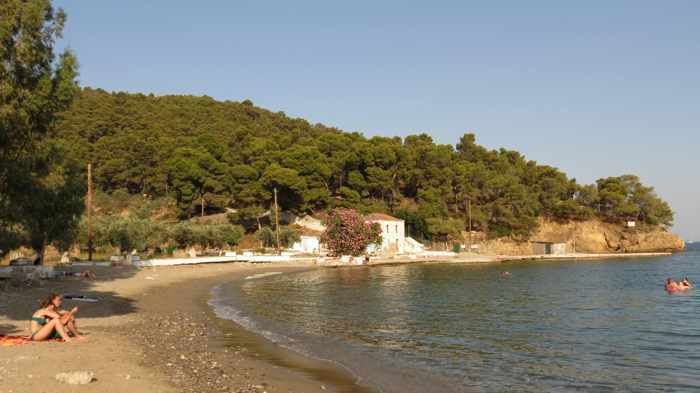 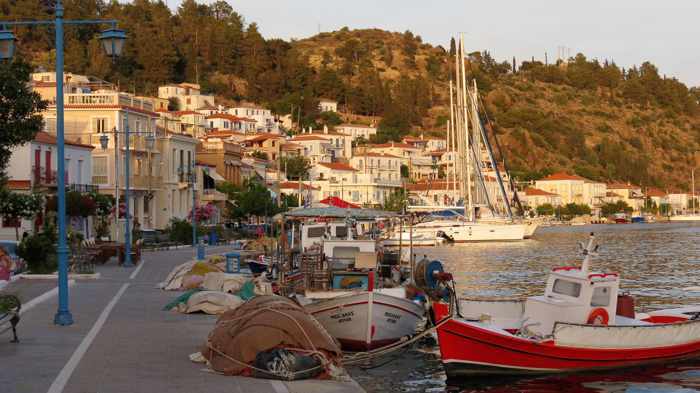 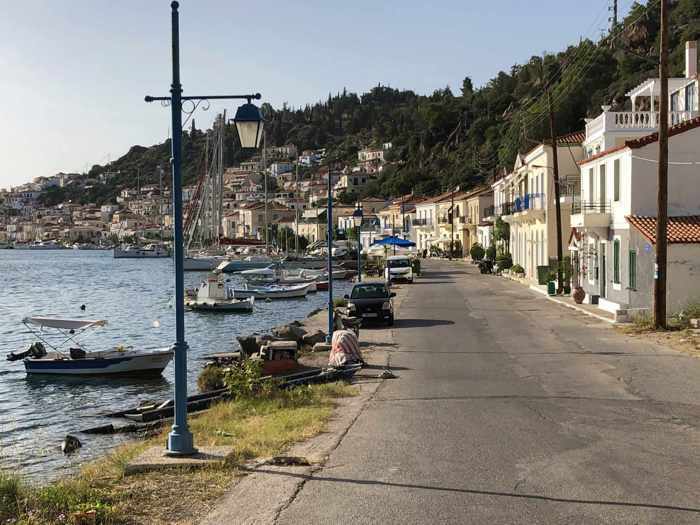 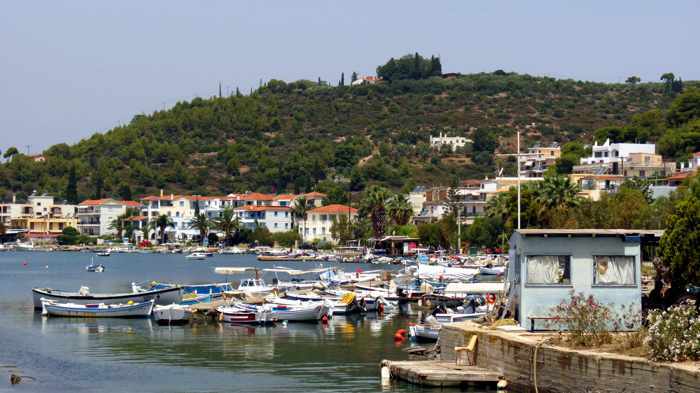 Poros island is lush with extensive pine forests. 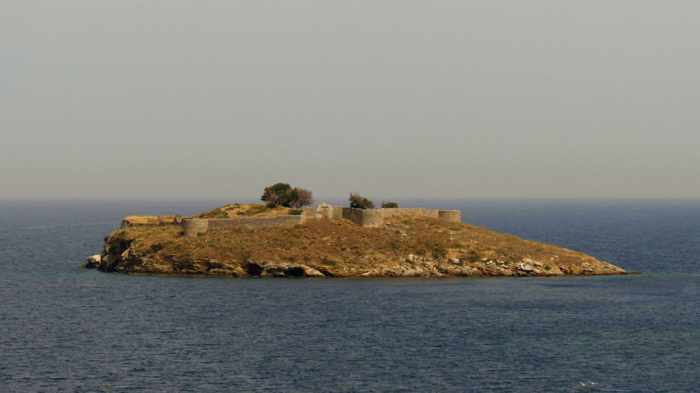 Ruins of a 19th Century fortress are visible on the Bourtzi islet near the eastern coast of Poros. 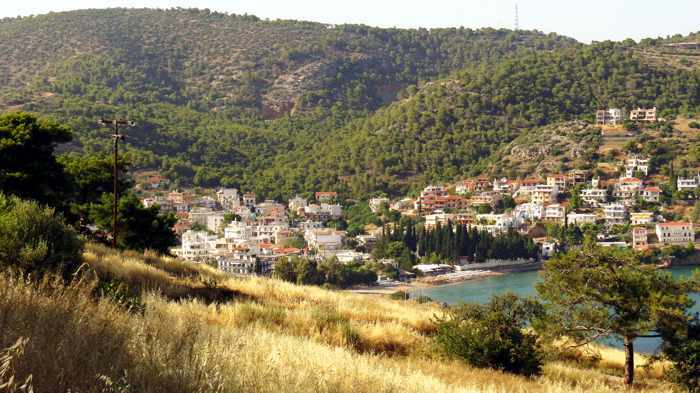 During Byzantine times, a castle stood on the site.